Each day, ocean-going ships pass up the Columbia River on their way to ports in Washington and Oregon. These vessels load and unload goods for import and export and in 2015 exports on this stretch of the river totaled 11 million tons. In order for the ships to move up the relatively shallow river, the U.S. Corps of Engineers dredges a channel through the river bottom. The Corps must dredge every year to maintain the 43 foot depth required by the largest vessels. The Corps is about to draft a plan for maintaining the Columbia River ship channel over the next 20 years. 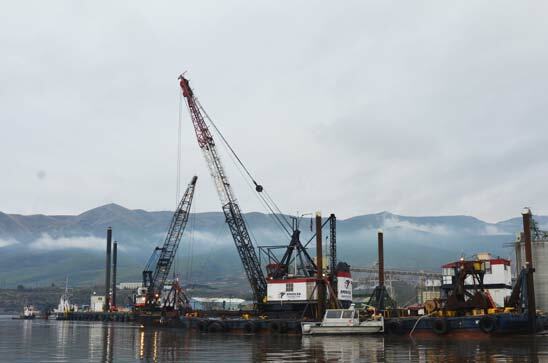 The Ports of Kalama, Longview, Woodland, Vancouver and Portland sponsor the dredging project. Annual dredging produces material call spoils that must be disposed of in an environmentally and socioeconomically sensitive manner. The Corps estimates dredging produces six to eight million cubic yards annually. But the current disposal areas are approaching capacity, the Corps says, and new disposal sites need to be found. Not only is the Corps identifying new disposal sites, but is also looking for ways to make dredging less necessary. It is looking for ways to recycle the dredge material for uses such as fish and habitat and ecosystem restoration. The National Environmental Policy Act of 1969 is one of the nation's oldest environmental laws. It encourages federal agencies to make environmentally responsible decisions and requires disclosing results of the agency's findings.. Collecting the right level of information at the right time is important to developing this plan, the Corps maintains. The Corps is planning a series of open-house style meetings around the region, including one in St. Helens. Community members can learn about the navigation channel, its use and planning for its future. Learn about the Corps' and sponsor ports' roles in this project and about the National Environmental Policy Act, the State Environmental Policy Act and the EIS process. Community members can also submit written input on what to consider in the environmental review. The St. Helens meeting is 4 p.m. to 7 p.m. on Oct. 16 at Meriwether Place, 1070 Columbia Boulevard in St. Helens. The public is invited. More information about the project, including how to submit your input can be found at www.nwp.usace.army.mil/lcrchannelmaintenance/.